In 2011 then it seemed that GL was intransigent about granting anything the TNA wanted. Obviously however this was not because of any principles, given that in 2002 he had been excessively indulgent about giving the LTTE anything they wanted. The conclusion then is inescapable that he simply deduced what his patron of the moment wanted, and then went much further. In 2002 he had been serving Ranil Wickremesinghe who was complaisant about LTTE demands, since he saw an agreement with them as the key to his future electoral success in contesting the presidency. In 2011 however GL served a different master, and this was not it seems the President, given his refusal, on the grounds that his neck would be on the block if things went wrong, to follow the President’s instructions about submitting a draft in accordance with what had been agreed with the TNA. Rather, it would seem that GL was working in accordance with what he thought were Gotabhaya Rajapaksa’s predilections. Basil certainly seems to have been of this view, and was bitterly condemnatory of GL when he mentioned him. Another instance of GL’s acquiescence in the Defence Secretary’s agenda was apparent late in 2013, when the South Africans launched an initiative to promote Reconciliation. The South African ambassador to Sri Lanka, who seemed anxious to help Sri Lanka, had long lost faith in GL, who he thought would not give the President any messages. He had therefore himself met the President to promote a dialogue, and the President proved enthusiastic and met with a high level South African team late in 2012 to formulate a plan – without GL being at the meeting. It was decided that a delegation be sent to South Africa to explore options, and the President, who had surprisingly invited me to the initial meeting, insisted that I go too. This was in contradiction of his assertion that the delegation would be from the SLFP, his own political party, a formula designed to leave out the hardliners from other political parties who were part of his coalition. I pointed out that I was not a member of the SLFP, but he said that did not matter. 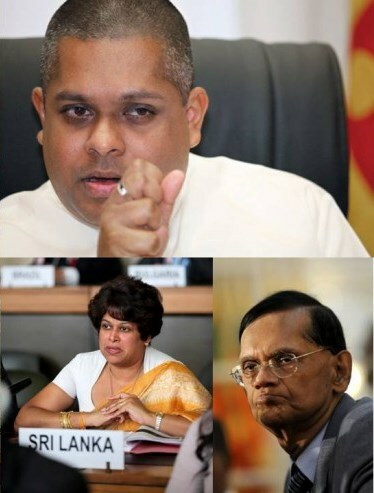 Unfortunately the leadership of the SLFP was not enthusiastic, and suggested a date far in the future. The ambassador called me and I contacted the President’s Secretary, Lalith Weeratunge, whose intervention seems to have proved fruitful because the delegation left for South Africa before the Christmas lull of 2012. However I was omitted, which was a pity because I had discussed expanding the powers of local government with the President, an idea he had welcomed, and I was perhaps the only one of those he had initially selected who understood how the original post-apartheid South African constitution had been later amended to strengthen the role of local authorities. This had happened in India too, as we had noted in our discussions with the TNA, and it seemed the obvious solution to fears about confrontation between the central government and provinces that saw themselves as the alternative centres of power. With none of the other members either enthusiastic or knowledgeable, that initiative failed, but the South African ambassador was indefatigable. Over the following year he promoted much interaction between Sri Lankan politicians and those who had steered the reconciliation process in South Africa following the initial agreement between Mandela and the apartheid government. His commitment became clear when President Jacob Zuma, at the Commonwealth Heads of Government Meeting in Colombo in November 2013, gave Sri Lanka a great opportunity to move forward while repudiating the unwarranted interference of the British Prime Minister David Cameron. He responded very positively to President Rajapaksa’s request for advice and assistance on the lines of the Truth and Reconciliation Commission which had reduced animosities in South Africa. The President’s request was clearly a great step forward, since it seemed to recognize the need for solutions based on culturally appropriate models of inclusiveness, rather than the oppositional punitive approach that Cameron was advocating. When I wrote about corruption last week, I concentrated on the structural absurdities that have been introduced into the allocation of development funding. Given the blatant deployment of this for electoral purposes, many politicians have the liberty to award contracts for projects as seems most beneficial to them, rather than the people they are supposed to serve. And while of course some development will occur, and perhaps a lot in some areas, the bottom line is that the people are no longer being fooled, as the last set of election results made clear. But I would be remiss if I did not talk too of the perceptions of corruption at the top, since the general impression seems to be that what we have now is a kleptocracy. I should note that the President himself does not figure in these rumours, though he too must know that some who do are alleged to also act as agents on his behalf. And sadly – though given his excessive indulgence of those close to him, I can see other reasons for his weakness in this regard – his failure to discipline them is attributed to worry about what they might reveal. Given what he has achieved however, there is little anger, except amongst those who disliked him in the first place. What is serious now is the erosion of confidence in those around him, and in particular with the immediate family. Thus, when I was recently in Kandy, I was told about a new hotel that was coming up that there were rumours that it was owned by Gotabhaya – and then later I was told that it belonged to Basil. That both stories should be circulating indicated that these were rumours, and it is quite possible that they are unfounded – or even that they are being spread by those who do own the hotel, and who think their position will be stronger for whatever planning needs they have, if it is thought that powerful people were involved. But I was saddened by this, remembering my father’s old friendship with D A Rajapaksa, one of the simplest and most honest politicians I knew, who had almost no assets when he lost his Parliamentary seat in 1965 and travelled home by bus.